Daniel Smith is determined to not become a grim statistic. He is making an effort to change his outlook on life and specifically education. The 16-year-old is one of 11 senior students from C. I. Gibson Senior High School, chosen to participate in a dual enrollment program at The Bahamas Technical and Vocational Institution (BTVI). The 10 boys and one girl are being exposed to the art of painting for fall 2015 and spring 2016. The three classes include Introduction to Painting along with Math and English two days per week. For Daniel, the trip to BTVI is a sacrifice, as he is a Kemp Road resident who is accustomed to walking to his nearby school on Marathon Road. Furthermore, his classes at BTVI begin at 8 am – an hour earlier than the start of classes for public school students. It means rising earlier than normal to be on time, in addition to catching the bus to and from BTVI twice per week. But for Daniel, it’s all worth it. “This is a good opportunity. BTVI is giving me hope and a trade,” said the bright-eyed 12th grader. 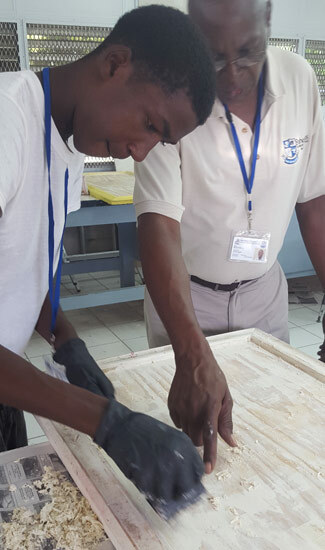 And although when he completes high school, Daniel intends to return to BTVI to pursue carpentry instead, he is still grateful for exposure to the painting program and post-secondary education. “I am learning how to properly remove paint, and I like the Math class especially. They really break it down,” said the young man. According to the head of C. I. Gibson’s counseling department, Carroll Minnis, the students need the motivation. “The program gives them some hope and makes school more tolerable. We are seeing change. When they come to school now, they are going to their classes. Teachers say they are more settled,” said Ms. Minnis. Daniel agrees and said the program is already positively impacting him. “I am staying more focused. I’m starting to change – come back to my old self. I began falling off in junior school, but I feel this is helping me because I’m getting in less problems at school. When I go to school, I sit small. I used to shout and talk plenty, but now, I stay in my corner,” he stated. 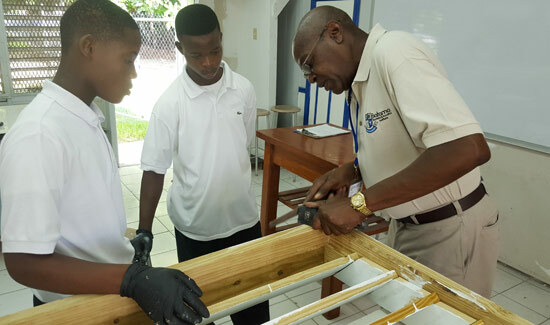 BTVI’s Dean of Construction Trades and Workforce, Alexander Darville, said besides augmenting what the students learn in Math and English at school, while learning a trade, there is a level of discipline they are receiving. “As simple as being on time, they have to adhere, as industry requires it,” he stated. Mr. Darville added that there is a misconception about technical education throughout the country; however, it is a necessary component of the labour force. “If you could flip a light switch on, thank a technical person. When you put your feet on a tile, thank a technical person. That brand new Honda you just bought, thank a technical person. We don’t see it until after things aren’t working, but if you have to live a life absent of technical people, you’d understand,” he stressed. Meanwhile, this semester Daniel and his peers are focusing on surface preparation of painting. Their instructor, David Barry, said any paint job is only as good as the preparation. The students will learn how to properly remove paint, the importance of building a paint system inclusive of a primer coat and the intricacies of painting various surfaces including metal, wood, drywall and even spray painting. Mr. Barry added that already, he is noticing a difference in the students. “They’re listening. There is a willingness to learn – all of them. They are all excited. The first class was about ethics, so even if they don’t return here, I’m training them for the workforce,” he stated. His classmate – and the lone female in the program – Shaquell Taylor, described herself as “lucky” to have been chosen. “I’m lucky because others could have been chosen to learn a trade, and the instructors here are making me understand what they teach us,” she said, adding that although she is among 10 boys, they show her respect. At the end of the program in spring 2016, there will be further collaboration between BTVI and C. I. Gibson, as the students are expected to complete a paint project at the school. LEARNING A TRADE – C. I. Gibson 12th graders Daniel Smith (l) and Devonta Rolle pay close attention to BTVI painting and decorating instructor, David Barry during a lesson. The students have been chosen for a dual enrollment program that has introduced them to the art of painting, while strengthening their Math and English skills. WATCHFUL EYE – Kyle Brown is under the watchful eyes of BTVI painting and decorating instruction, David Barry, who says that preparation for painting is 90% of the job. The 16-year-old is one of 11 C. I. Gibson students participating in a dual enrollment program. 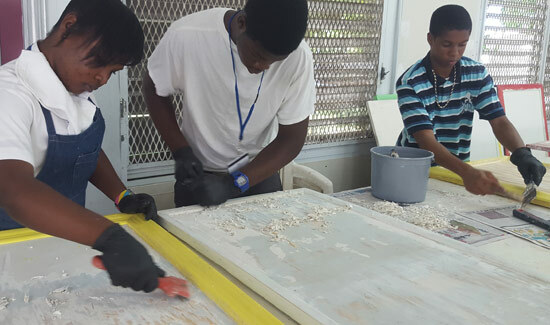 SURFACE PREPARATION – C. I. Gibson seniors, Shaquelle Taylor, Fabian Shepherd and Marchario McDonald are hard at work preparing surfaces for painting. The students attend BTVI twice per week as part of a dual enrollment program.